On a recent excursion to the culinary Disney World known as Wegmans, I came across a package of fresh store made seafood sausage. 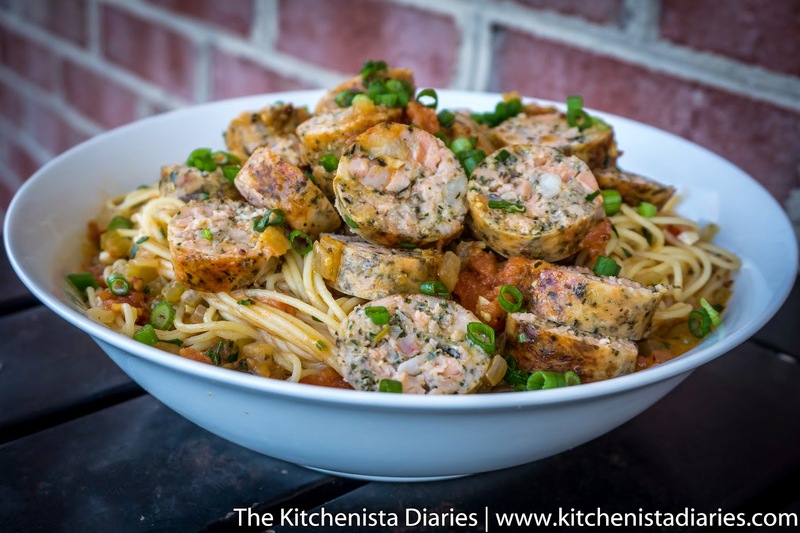 I flipped the package over to scan the ingredients, and after seeing it was made with shrimp and salmon there was no way I wasn't going to try it. I figured it would make an inexpensive and fun lunch dish. But what to do with it? Well, the ingredients for the sausage also noted fennel, mustard, parsley and garlic. 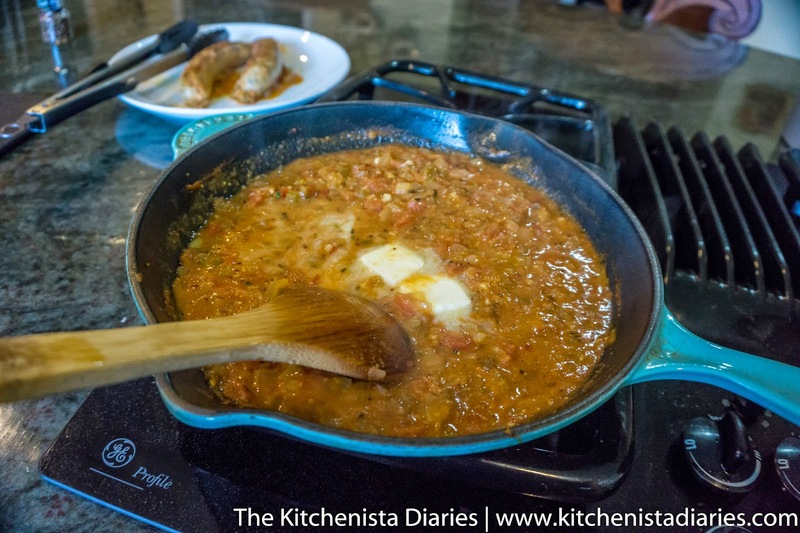 With that flavor profile in mind I thought of a white wine creole sauce I made last week for mussels. 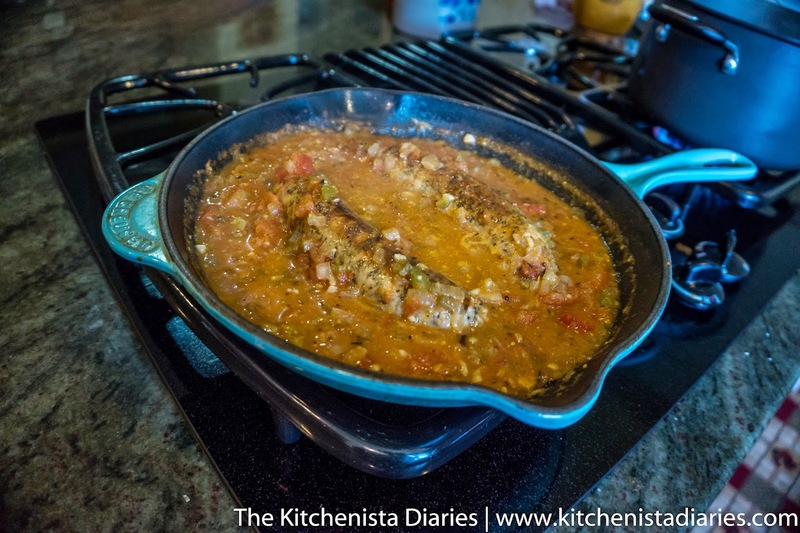 Although the photos didn't pan out for a blog post, the idea lingered. Today I happened to have some fresh tomatoes and enough scraps to pull together a "trinity" so I took it as a sign to proceed with the sauce again, albeit a simpler version. It's nice when recipes end up working out even if it's in an unexpected way. Originally I had grits in mind as a base for this sauce, but made a last minute switch to angel hair pasta for something much lighter. 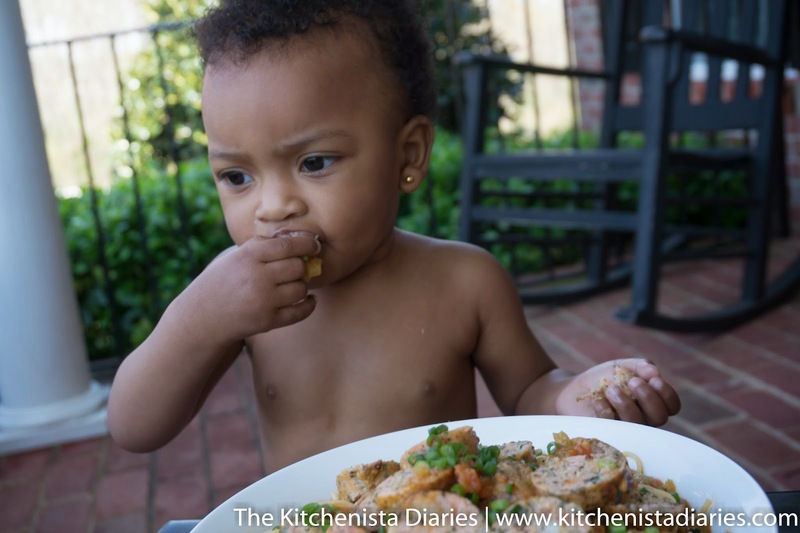 I still think grits would be delicious as a dinner entree, so have fun and use the sauce however you'd like. 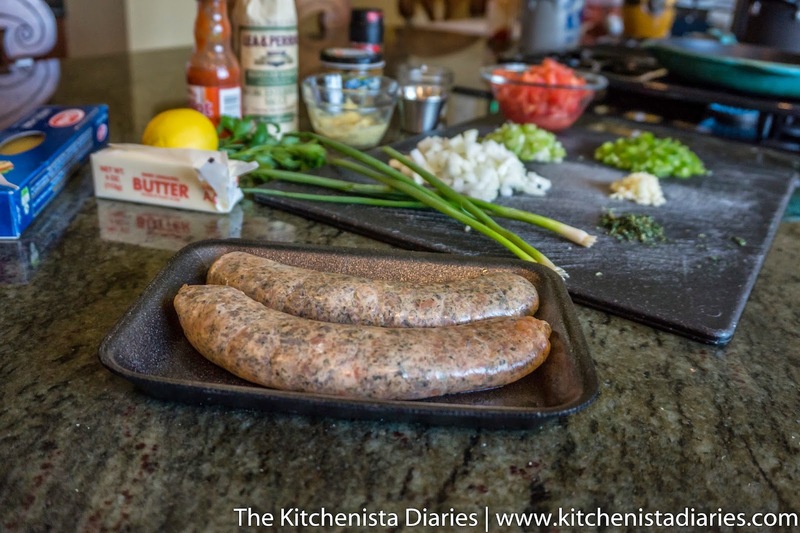 If you're unable to find seafood sausage I did see quite a few recipes online to take a stab at making your own. 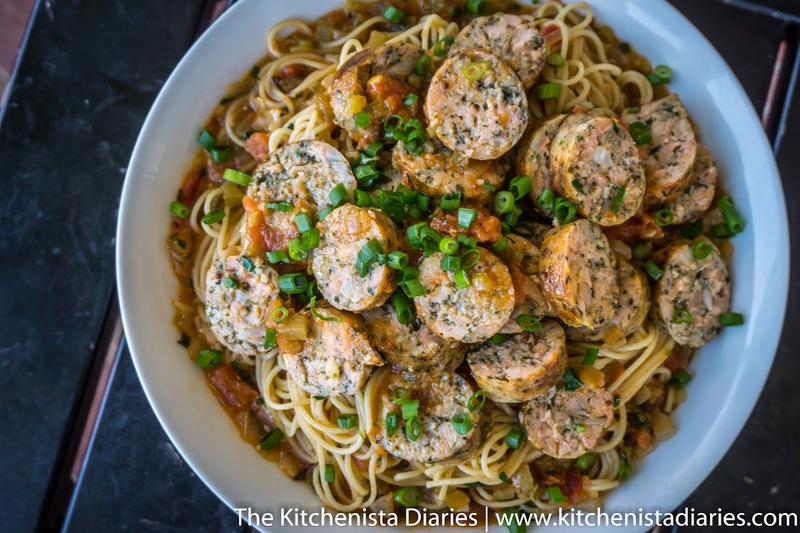 Otherwise, this would work great to modify for Andouille sausage, shrimp, or even mussels. On a personal front, I'm 33 now, Biscuit is 1, and Jaden is 12...yes, we had a very busy first week in April! 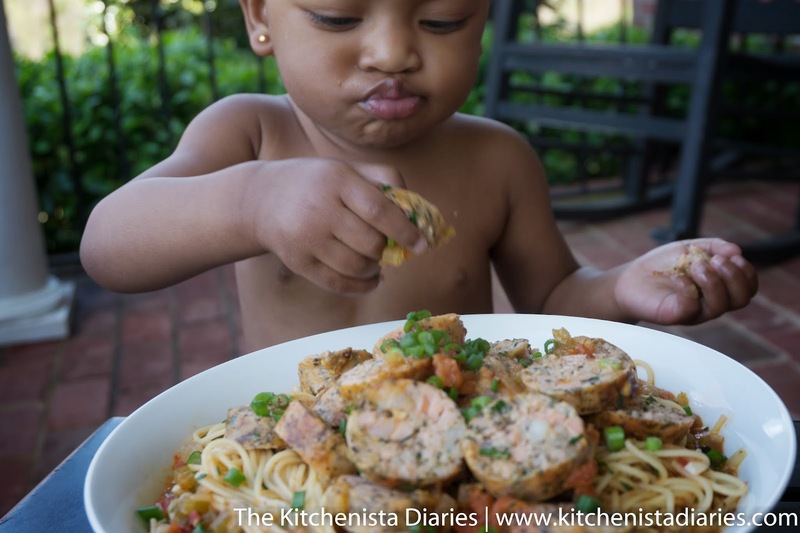 Yesterday was also the 3rd anniversary of The Kitchenista Diaries! Can't think of a better way to celebrate than load up on some new recipes here and I have some goodies in mind to share. I'd like to promise I'll get to all of them this upcoming week, but life happens... so, day by day we'll see how many I can bang out, deal? 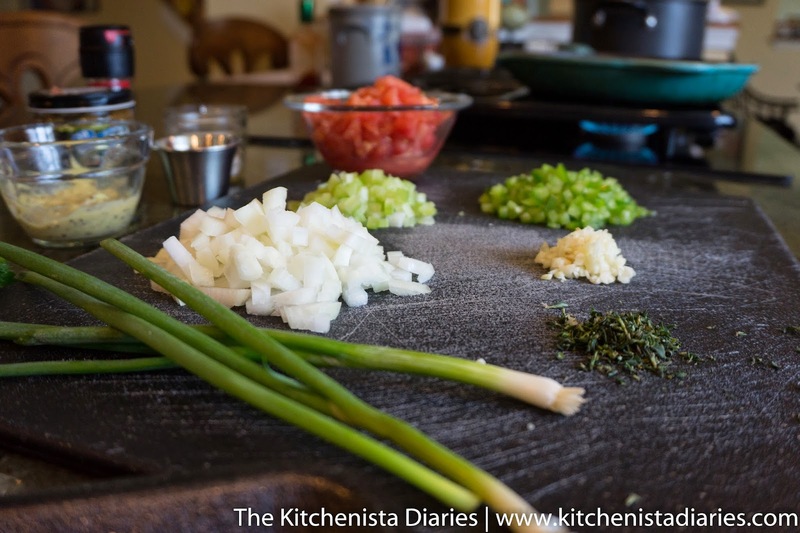 The sauce cooks quickly so you'll want to have your ingredients prepped and ready to go prior to starting. I noted above a few suggested substitutions if you don't have exact ingredients. Today I used concentrated clam base for my stock along with hot water from the pasta pot. I've made the sauce many times with a splash of Sauvignon Blanc to deglaze and/or chicken stock for additional flavor. Use what you have and don't stress it too much. I respected the creole "trinity" of onions, bell pepper and celery, despite the fact that I hate celery. I am absolutely certain this would be delicious with some diced fennel swapped in for the celery although I chose to go the traditional route today. Regarding the sausage, yours may suggest a different cooking time based on how it's made although I can't imagine it would be that much longer for seafood. If you use another protein or pasta, just adjust the cooking times appropriately. 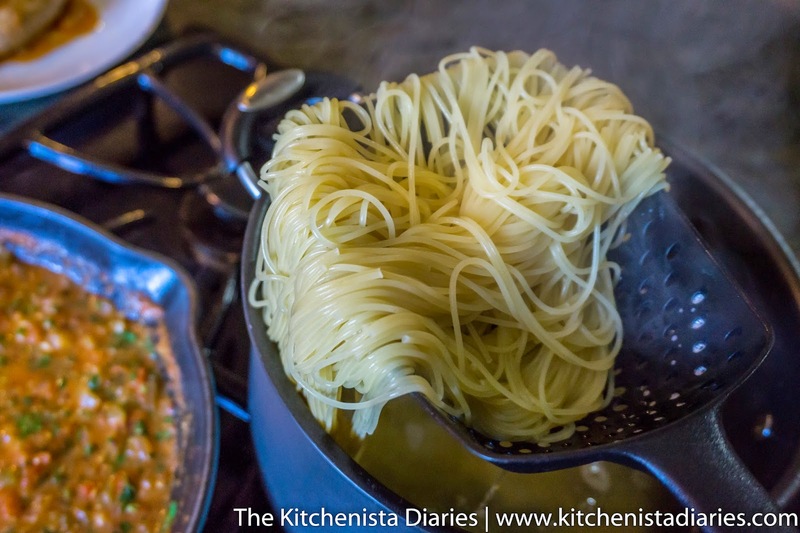 It will probably take longer to boil the water than it does to cook the pasta, so get that going while you prep. I added a fresh bay leaf to the water and salted it generously. 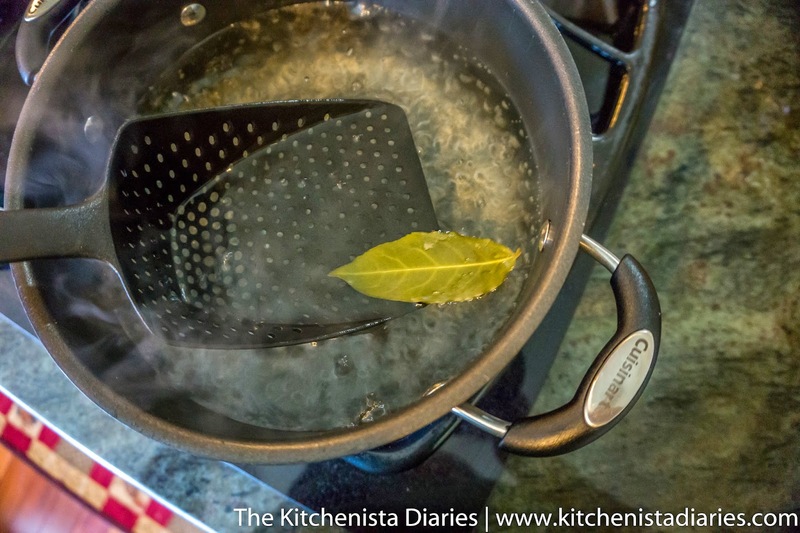 By the time your pasta cooks the water will be infused with the bay leaf and add a little more flavor to the sauce. 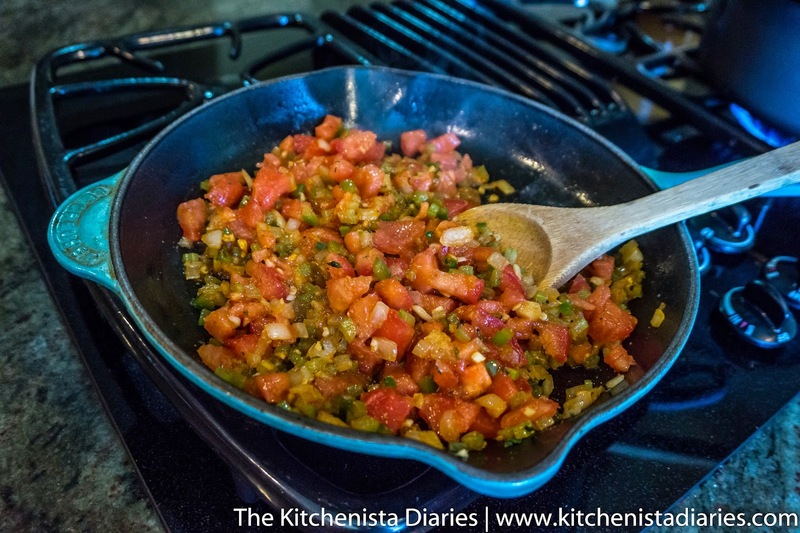 To begin, warm your skillet over medium high heat. 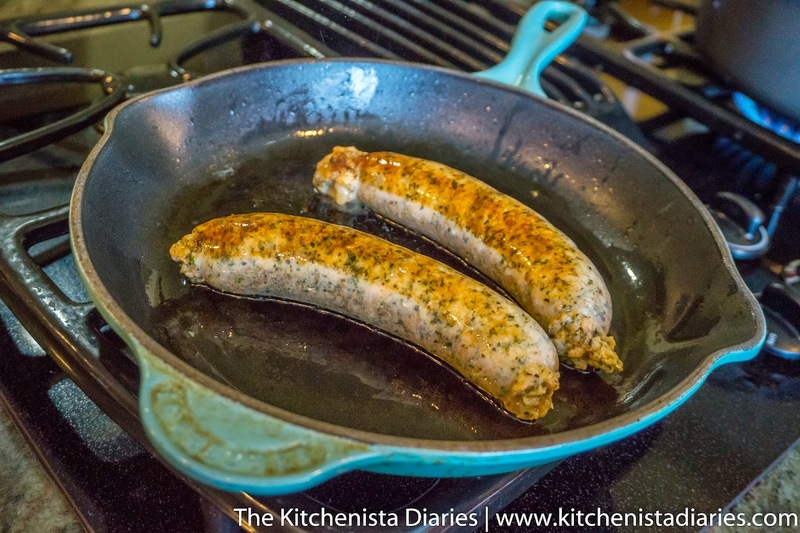 Add enough olive oil to lightly coat the bottom of the pan and brown the sausage on all sides, 2 to 3 minutes. My only criticism about this particular sausage is that the casing was pretty delicate and started to split at the ends fairly quickly. Wasn't a big deal for this preparation. 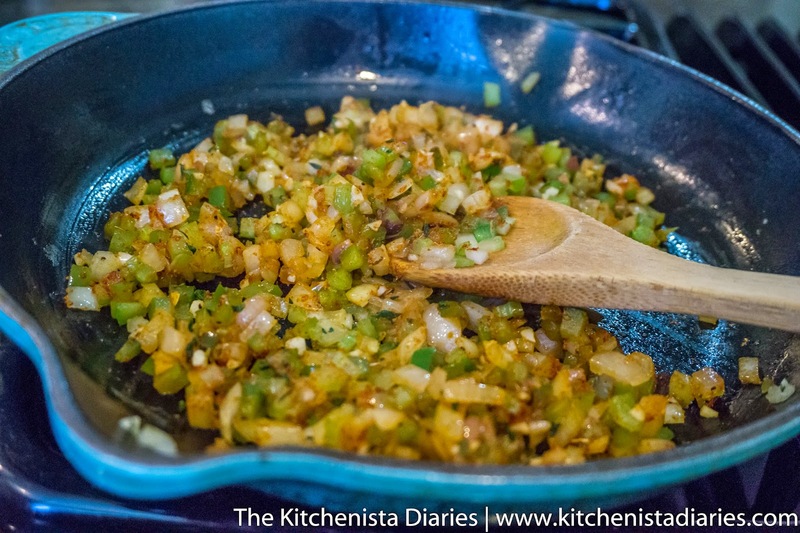 After the sausage was browned, but not cooked all the way through, I removed it from the skillet and added the onions, celery and pepper. After seasoning with a pinch of salt, I sauteed the veggies until they softened, 2 to 3 minutes. The garlic, spices and thyme were added next and stirred into the trinity for a minute to distribute. 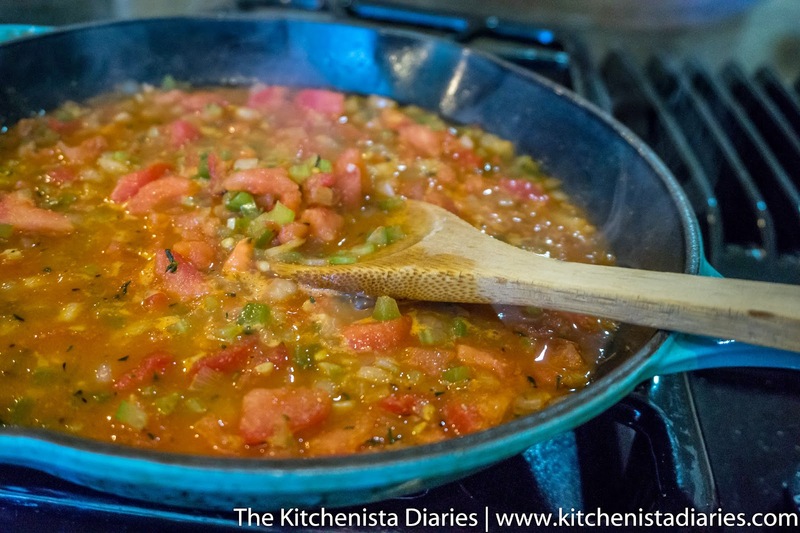 I added the tomatoes next, seasoning with a pinch of salt. After a couple minutes the tomatoes released their juices and I added a cup of stock. I turned the heat down slightly and let everything simmer for a couple minutes. The sauce is beginning to take shape now! If you haven't already, you should taste as you go and monitor the flavor changing. At this point I added a heavy splash of Worcestershire sauce (a little more than a tablespoon), the mustard, hot sauce and zest of my lemon. Lemon juice can get bitter as it cooks so I prefer to add the juice at the very end just before serving. 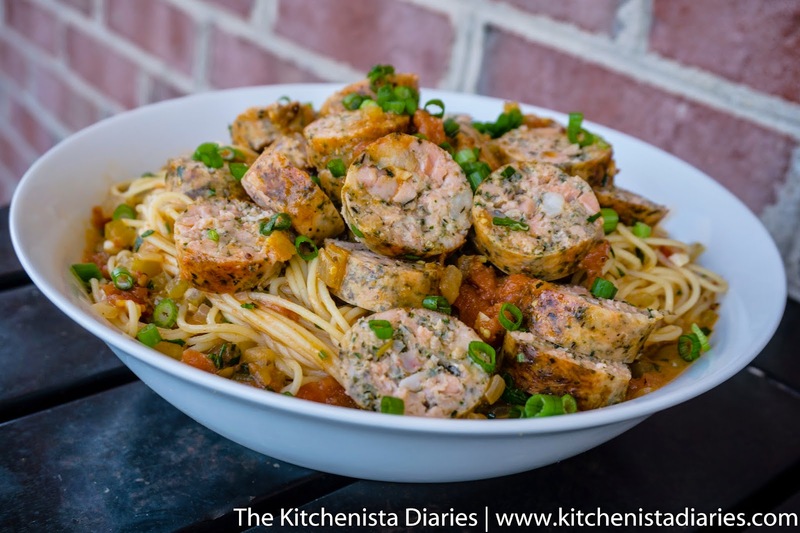 Once the sauce was seasoned to taste, I nestled the seafood sausage links back into the skillet. These only took another couple minutes to cook through and firm up. At this time my water was boiling so I dropped in the angel hair pasta. Stir the noodles frequently to prevent sticking. ...and a good squeeze of lemon juice along with the parsley for freshness. 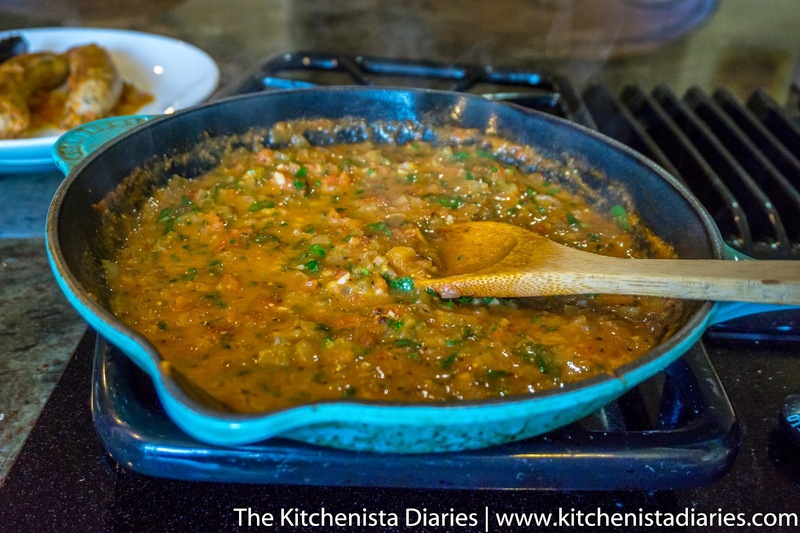 This creole sauce is so versatile, so I hope you use it for other things! Only thing you'd want to do is switch up the type of wine or stock used depending on ingredients. When my pasta was cooked "al dente" I transferred it to my creole sauce along with a half cup or so of the starchy bay leaf-infused pasta water. The most important thing to do with pasta after cooking is to stir it into the sauce and let it absorb all those flavors. It just takes a minute or two, and tongs are your best tools. 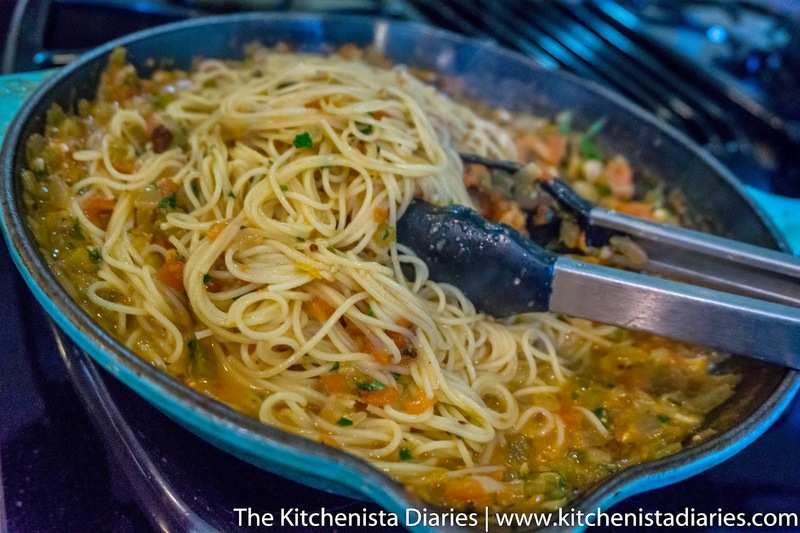 If you need to loosen up the sauce a bit just add more pasta water. 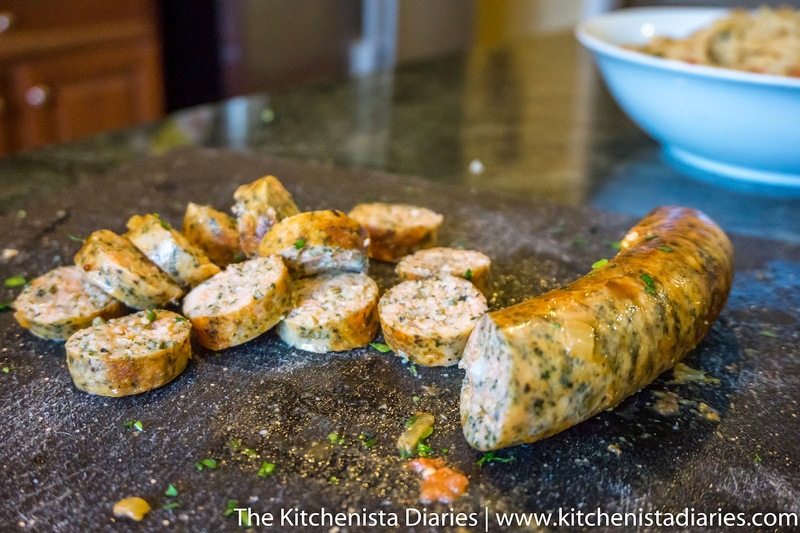 Just before plating, I sliced up my seafood sausage. Of course I stole a couple pieces. It was good, not that I expected less from Wegmans. I'd definitely buy this again and maybe try it grilled as the package suggested! Time to eat! 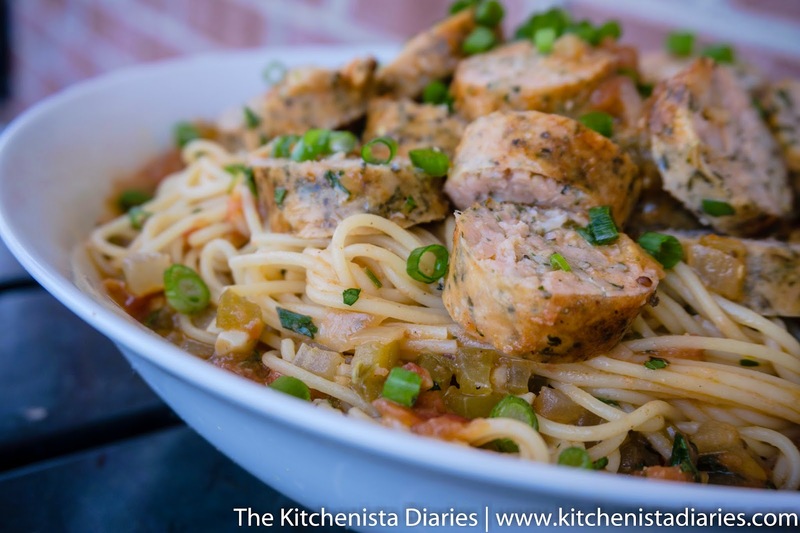 I served this family style, filling up a huge bowl with the angel hair pasta and creole sauce. 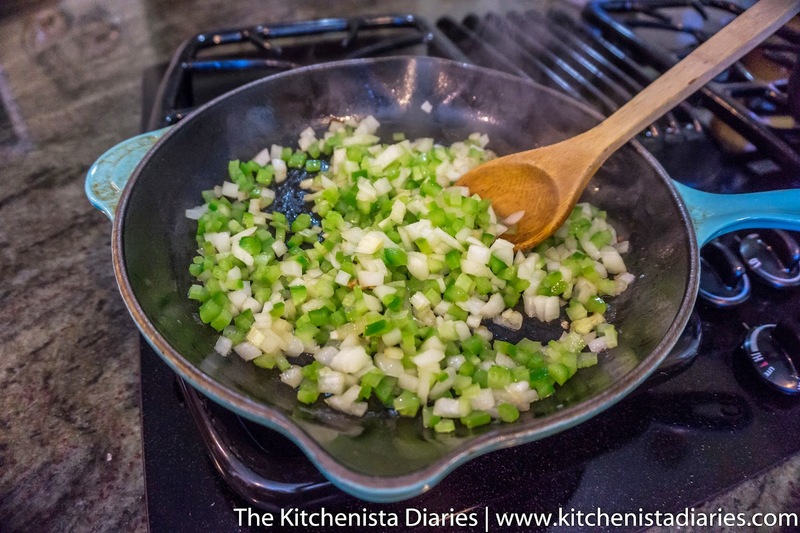 Then I topped it with the sliced sausage and lots of fresh scallions to garnish. I drizzled a little bit of good olive oil over the top too, as I do for most pastas. Simple, but so flavorful and a nice treat for lunch. Raven agreed. This little girl is too much! I had to make some some substitutions based on what I had on hand but this is a great core recipe! Thank you for sharing! !